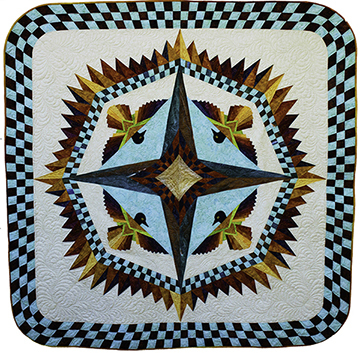 This medallion style quilt features new techniques, and measures 58″ x 58″, the perfect size for a dramatic wall quilt. I have long been fascinated by our feathered friends and, living in the Southwest, the Thunderbird design is prominent in various art forms. And, I have a new passion for checkerboard designs with their strong graphics in contrasting colors. When Ricky Tims and Alex Anderson asked my to be on The Quilt Show, I immediately knew that I wanted to create something special for the show. 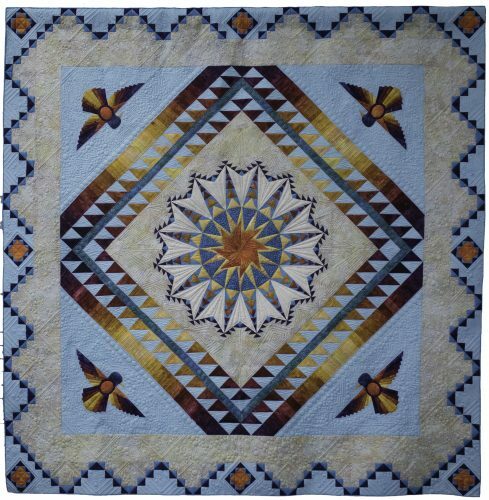 Thank you Barb Deshler, for your terrific applique, Afton Warrick for foundation piecing, and Kris Vierra, for the magnificent machine quilting. The pattern features full-size pieces, so no enlargements are necessary. For the gradations, I used the 12 Fat Quarter Pack of Starr Designs Autumn Colors in this design, available below on this page. My third book, Flying Colors, released by C&T Publications in August 2010 is still available on this website. 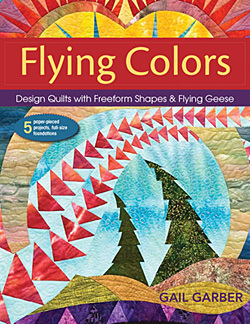 Flying Colors takes the traditional goose beyond tradition into a heady world of free-form design. No longer just for geese, the curvy filler strips can hold many different designs, and 14 different fillers are included among the pages, along with 5 full-size patterns. Thank you to all of my students who generously allowed the use of their quilts in the book! 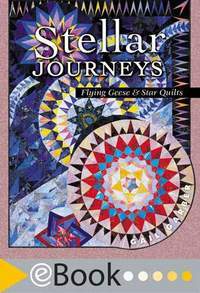 First published in 2001 by the American Quilter’s Society, this 80-page book leads the reader through a series of simple exercises that teach how to design your own circular stars, complex borders, and those magnificent, free-form flying geese. Also in the book are numerous photos of my quilts over time, several patterns, and a gallery section that includes student designs. This book is out of print and I have no remaining stock. It can be downloaded as an e-book from the American Quilter’s Society for $12.00. The inspiration for Cartwheel Constellation was the pineapple block that is prominently featured in the star center. The rest of the design evolved from that block. Notice that the pineapple block, when placed immediately next to the star points creates a delicate feathered star appearance. I used the 20 Pack of Fat Quarters by Starr Design Fabrics to create this quilt. See fabric section below to select the color range you prefer. Because hanging a circular quilt is challenging – to say the least!, a while back, I discovered this amazing product called Quilt Shaper. It is a fine weight steel that is inserted into the binding of your irregularly-shaped quilt once the entire quilt is complete. Insert the steel into your binding, cut to size with high quality tin snips (or nippers), and the secure with the closure provided. 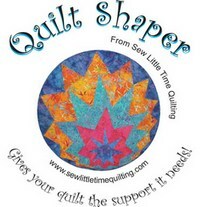 Quilt Shaper comes in two sizes, 12′ for smaller quilts and 25′ for quilts that are larger. Cartwheel Constellation used the 25″ length but there was enough remaining to use on another smaller quilt. Little Goose, Little Goose, Fly Away Home! Create this charming house block with a flying goose insert. Designed for students of all skill levels who wish to learn Gail’s creative design and piecing processes and techniques with a small (18″ x 18″), easy to finish pattern! This little quilt can be finished in one day – no UFO sitting in a closet for months! The pattern includes detailed instruction in freezer paper piecing techniques and curved seam piecing. Kits are available for $25 (pattern extra). 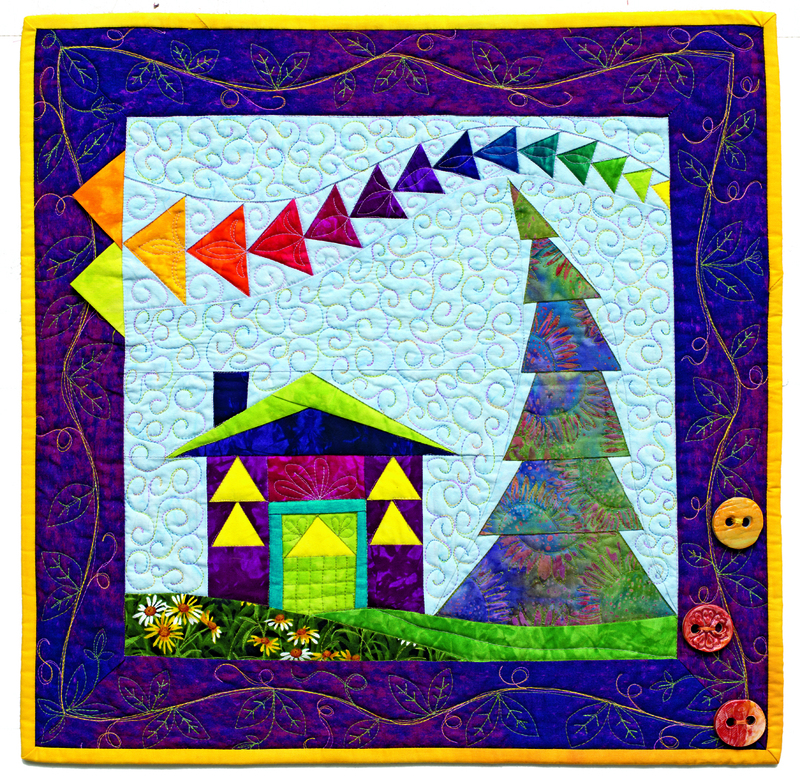 Tutti Frutti is the pattern used in the class, Scrumptious Star Stitchery. Barb and I have revised the pattern to make it suitable as a stand-alone pattern! Further, we’ve added curved Flying Geese in the outermost border of the square version. Both the octagon and the square are included in this pattern. Full size pattern pieces are included. Toss that grade school compass that’s in your desk! The 975VK compass by Alvin Co. is simply the best compass at a relatively low price. After conducting a two-year search, I haven’t found anything comparable. It has an extender bar that enables circles up up to 24 in diameter. It has quick release levers to open and close the compass quickly, as well as a fine-tuning dial knob, and it locks in place! It also holds a mechanical pencil, thereby ensuring accurate line width and reducing error due to ever widening pencil lines with standard pencils. Click here for compass assembly directions. NEW! This extended compass from Alvin makes circles up to 48 inches in diameter. 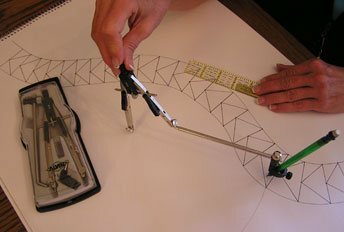 If you want to draw a BIG circle, this is the tool! 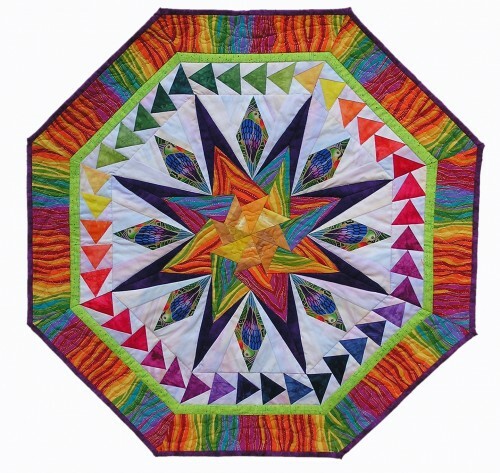 It’s perfect for drafting a large star or other circular design. It has a spring-loaded thumbwheel, which allows for smooth movement and precise adjustments. Includes an interchangeable ruling pen, pencil and divider legs, plus spare lead and needlepoint. This high-quality flexible curve is essential for drawing free-form shapes. Use it to audition the line on paper before you draw. Not all flex curves are created equally. Some bend in a smooth, continuous curve while others are bumpy and lumpy. 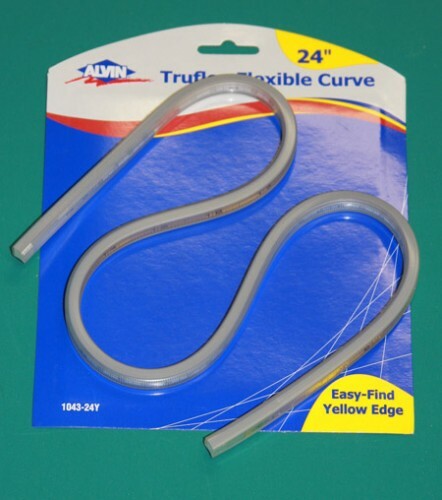 This high quality, Alvin, aluminum-core flexible curve is used by architects and engineers, and now, quilters! 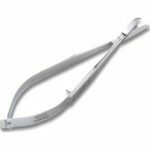 Perfect for drawing free-form flying geese and other shapes, this flexible curve is the tool for the job. It bends easily and is not stiff, unlike some other flexible curves. It also comes in two different lengths. 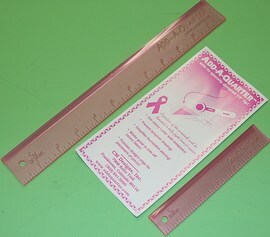 With a perfect quarter inch, this Add-A-Quarter ruler is just the tool for trimming seam allowances when paper foundation piecing. After adding the seam allowance, you will instantly have a raw edge to which you can align the next fabric piece. You’ll find lots of uses for this bright pink ruler with its specially designed 1/4″ lip. If you are like me, you might wonder why it is that you need yet another ruler. Well, this one is perfect for adding the ¼” seam allowance to free-form shapes. I like to think of this as my little yellow convertible sports car, much easier to drive around curvy shapes than those larger rulers that I think of as school busses. Used for trimming completed foundations, it’s also perfect for drawing and measuring. I love these little rulers for all sorts of purposes. They are the right size for drawing in detail in your design, adding a seam allowance, or taking a quick measurement. Conveniently sized, either one easily fits into your take-along sewing kit. I love using these scissors for paper piecing! The Snip-A-Stitch is the perfect scissors for removing a single stitch or for easily ripping those tiny paper piecing stitches (not that we ever make a mistake!) The notched blade slides easily under a single thread or line of threads and cuts quickly and cleanly. An easy squeeze action is ideal for tired or arthritic hands and reduces hand fatigue. 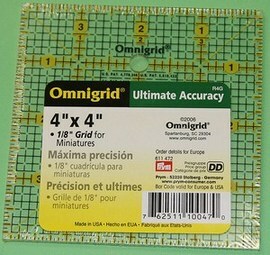 Great for all types of needle arts and embroidery! 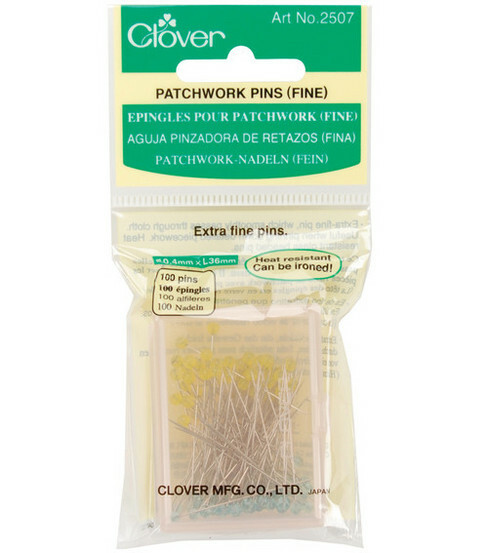 Patchwork Pins (Fine) include 100 extra-fine (.4 mm) pins with heat resistant heads. This is a marking pencil that actually works! It makes a nice thin white line which shows up on all but the lightest fabrics. The lines stay visible while you are quilting even when you scrunch and fold the quilt. Plus it comes with a pack of white lead refills. I’ve had my pencil for 3 years now and I still haven’t used up the first lead. I love this eraser for precision erasing during the design process. It’s accurate, erasing only those lines that need to disappear, and it can be refilled. Standard pencil and large rectangular erasers are inevitably crumbly, dry out, leave unsightly marks, and erase more than is intended. You’ll be spoiled by this soft, clean white, almost unending eraser. Just click to lower more eraser power! 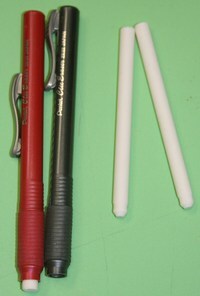 The refill pack contains two 4″ long refills. Those of you who have taken my classes know just how much I love Starr Designs fabric. It is high quality, beautifully dyed, and comes in a wide rainbow of colors and gradations. I use it in almost every quilt I make! They use high quality cotton prepared for dyeing fabric and Procion Fiber Reactive Dyes, and most of their colors are their special custom creations. The fabrics are washed 2 to 4 times and do not need prewashing. When washing a finished project, they recommend warm water with Synthrapol soap. I’ve chosen my very favorite fabric bundles to offer here. The Skittles bundle contains 20 bright hand dyed fat quarters including every color in the rainbow. The Country Fair bundle contains 12 hand dyed fat quarters with dark rich, autumn colors. 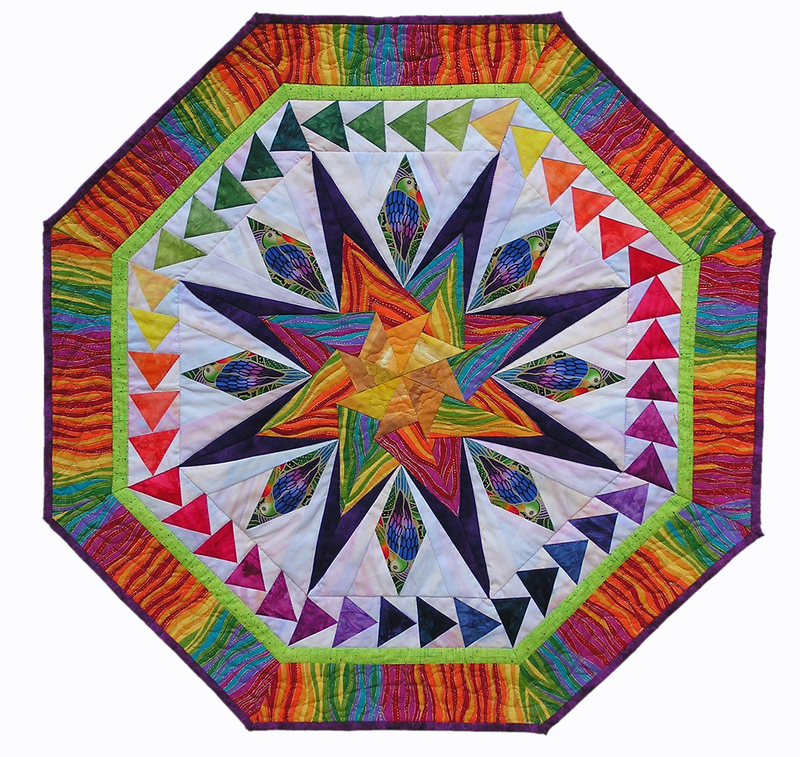 The Fireworks bundle contains 12 hand dyed fat quarters with bright primary rainbow colors. The Lite Bright bundle contains 12 hand dyed fat quarters with pastel primary rainbow colors. The Jubilee bundle contains 8 hand dyed fat quarters with bright primary rainbow colors. The Blue Suade bundle contains 8 hand dyed fat quarters from the Suade line. They are slightly stirred to give them a more suaded look. The Mardi Gras bundle contains 8 hand dyed fat quarters with pastel primary rainbow colors. They are the light version of the Jubilee 8 Pack. The Fairy Flutter bundle contains contains 8 hand dyed fat quarters in brighter medium shades. The Skittles Dye-It Bites Pack contains 20 fat eighth yard cuts in every color in the rainbow. The Fall Fantasy Dye-It 20 Bites Pack contains fat eighth yard cuts of the 20 colors shown. The Country Fair Dye-It 12 Bites Pack contains fat eighth yard cuts of 12 dark rich country colors. The Jubilee Dye-It 8 Bites Pack contains fat eighth yard cuts of 8 bright primary rainbow colors. The Mardi Gras Dye-It 8 Bites Pack contains fat eighth yard cuts of the 8 pastel primary rainbow colors. They are the light version of the Jubilee 8 Pack. The Hawks Aloft 2018 Raffle Quilt, stitched in one weekend by 12 stitchers, using paper foundation piecing techniques. 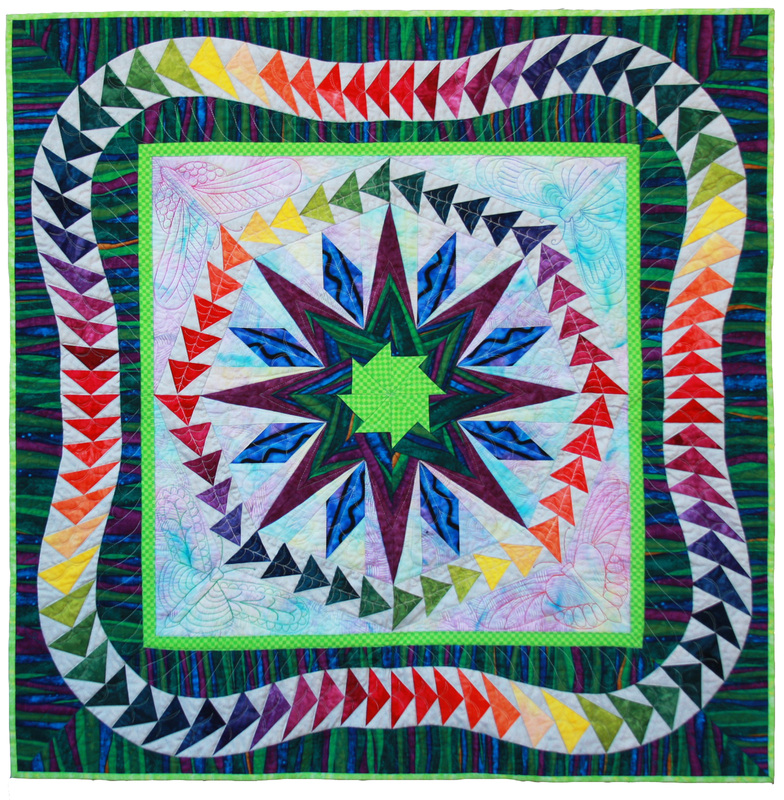 It was longarm machine quilted by Tisha Cavanaugh, Albuquerque, NM. Her business is called, “Quilt Icing”. 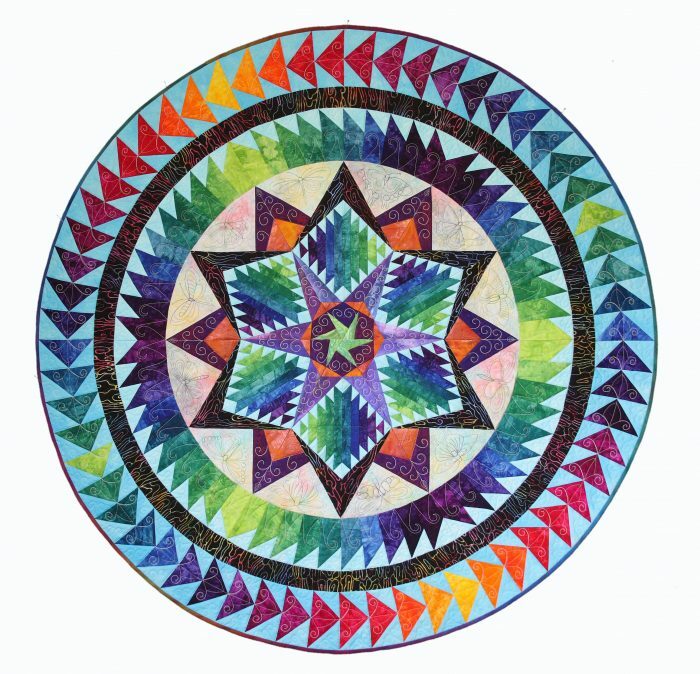 The quilt measures 90″ square and we will draw the winning ticket on December 1, 2018.